If you’re a mom like me, you see other moms everywhere and everyday—at the playground, the supermarket, at your exercise class. Maybe you talk to some of these moms. Some you know casually and others are your friends. However well you may know them, how much do we truly know someone? Beyond the ‘sides’ or ‘roles’ they display in public, do you know who they really are? Do you know their ambitions, desires, or vulnerabilities? Self-awareness and knowledge is more difficult when we become mothers. We become so consumed with taking care of our kids that there is no time or energy to think about ourselves. As much as we don’t truly know others, how much do we really know ourselves? Self-awareness and knowledge is more difficult when we become mothers. We become so consumed with taking care of our kids that there is no time or energy to think about ourselves. Once the kids get a little older and you have time to breathe, you realize you’ve lost touch with yourself. You’ve forgotten who you are and you wonder what is next. Having your portrait taken is a meaningful first step in reconnecting with yourself. It is a way to reconnect to the many sides of you and explore who you are. I call seeing the images from your session a ‘reveal’ because I am revealing yourself to you. Some of the common reactions to reveals are “I’m more confident than I thought,” “I look so put together,” and “this reminds me of myself before I had kids.” It’s a way to explore who you are and realize there is much more beauty and strength in you than you realize. Visit the Experience for Women page to see how other women have reconnected with themselves. My Open House on Sunday, March 25th was an amazing success. Our sense of self and self-perception become warped as teenagers and that carries into adulthood. Discovering who you are means seeing many different sides of you. Live your life with more authenticity, intention and purpose. Subscribe to the “I Matter” Newsletter to follow the journey where it all began. Read exclusive content not published anywhere else, receive updates and important announcements. 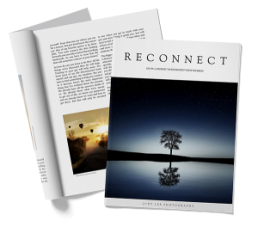 Also, receive access to your online copy of “RECONNECT: Go on a Journey to Reconnect with Yourself” free with your subscription.